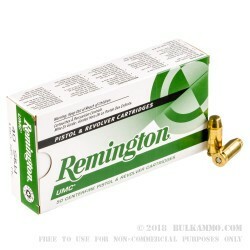 Remington UMC is offering a high quality and value priced .40 S&W load that you can easily take to the range or to your next class put on by your department. 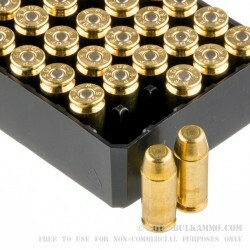 These .40 cal bullets are 180 grains and have a full enclosed heavy-duty Metal Case around the lead core. 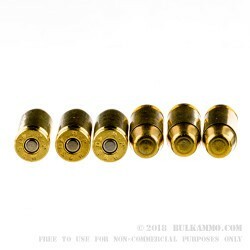 The bullets are loaded into new, reloadable, non-corrosive Boxer primed brass cases. The muzzle velocity is 990-feet per second and the muzzle energy is 392-foot pounds. These 500 round cases come in a 10 pack with 50 rounds in each box, making the ideal 500 round case for your next training course. Get yours today. The .40 S&W load was developed in 1990 as a middle ground between the 9mm Luger cartridge and the 10mm cartridge. At the time, the 10mm had become extremely popular with the FBI, but there were some in the FBI that could not handle the bigger faster 10mm round. The FBI decided it wanted something that could still hit hard and do similar damage, but with less recoil. After a lot of T&E and R&D, the FBI figured out what combo of factors and components worked best for what they required. Then they asked S&W to carry the torch the rest of the way, and the .40 S&W was born. The .40 caliber bullet is 0.40” inches in diameter which happens to be 10mm in diameter as well. Coincidence, don’t you think? 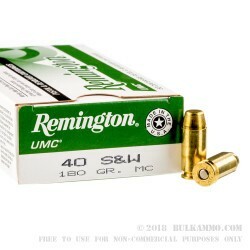 The .40 caliber bullet is available in multiple grain sizes, from 105 to 200 grains. Many departments are still using the .40 S&W today.